Our Tuvalu Laguna Beach store opened in 2003 - it's our 10 year anniversary in the same wonderful community! We pride ourselves on showcasing a variety of items from all over, items that will keep our customers coming back regularly to see what’s new and exciting. What has developed over the years is a treasure trove of furniture, accessories and artwork, all with the casual, coastal and eclectic design vibe we love. The success of Tuvalu is based on many elements from finding unique products, creating unique collections, and having a great team able to translate our design concepts when the merchandise hits the store floor. We know many stores have similar products, so our goal is to make the shopper’s experience unique and memorable, keep the store ever changing and diverse. We completely remerchandise the store 4 times a year, and go to home markets and flea markets to source one of a kind finds (which is a blast!) We hope that our website will serve as an extension of our store, and that you can shop it with the same excitement that you would if you were here in Laguna Beach! The “Design Studio” space was added to the Laguna Beach store in early 2012, to offer full, turnkey design and decorating service. In addition to furnishings and accessories, the Design Studio showcases a library of hardwood floor, tile, fabric, wall covering and window treatment options. It’s all about working together to achieve the perfect space for clients and making the design process enjoyable for them. Working closely with her team of designers, Tuvalu founder Laurie Alter offers a 100% satisfaction guarantee policy on design services. From special orders of tiny accessories to outfitting an entire house, if clients are not completely happy with every detail, Laurie and her designers will work diligently until everything is 100% perfect. And for those not in the southern California area, we will be offering Tuvalu "Design TuGo" services later in 2015, to provide online design consulting and decorating packages. Our San Clemente store opened in 2015. Born and raised in Laguna Beach California, Laurie Alter is the founder and owner of Tuvalu Home, and chief designer and visionary for all design projects. She combines her love of family and the coastal community she grew up in, with a passion for creative design, and a motto that you should never take life too seriously – fun is essential; relax, enjoy it, and always have a sense of humor! As a trained designer, Laurie worked on a number of residential design projects in California before moving to McCall Idaho with her family. There she traveled on weekends to shop estate sales and collect pieces she loved, later opening an antique studio called “Wild Goose Chase”. As their children grew, Laurie and her husband felt being closer to family was a priority, and after 8 years in Idaho, returned home to Laguna Beach where Laurie opened Tuvalu in 2003. The original vision of showcasing accessories and furniture expanded into a full scale interior design division with the success and publicity generated by her design work in the Sunset Magazine Idea House, 2005. 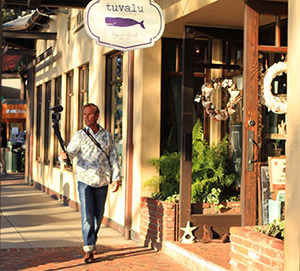 And at the center of it all, Tuvalu is a family business grounded by a love of community, treasured relationships, and the coastal, California lifestyle. Laurie is inspired everyday by the authenticity and spirit of her father-in-law, Hobie Alter. With a relaxed, honest, and thoughtful approach to design and the people around him, Hobie Alter always kept focused on the creative process that gave him pleasure, in the process helping make it possible for thousands of people to enjoy the ocean as part of their daily life. Revolutionizing the world of surfing in the 1960’s, Hobie created the renowned lightweight Hobie board surfboard, and later modernized the sailing community with the lightweight Hobie Cat catamaran. 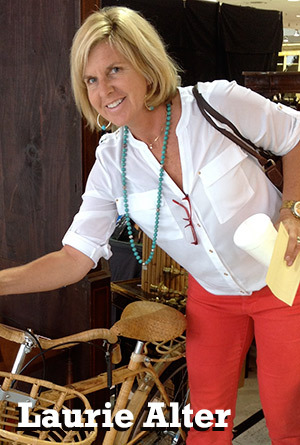 Today in addition to working at Tuvalu and designing residential interiors for clients, Laurie Alter works closely with her brother and husband to bring her coastal design style to the Hobie Sand Bar restaurant, and The Ranch at Laguna Beach (a golf course, 97 guest suite hotel, restaurant, wedding venue, and spa, opening September 2014).